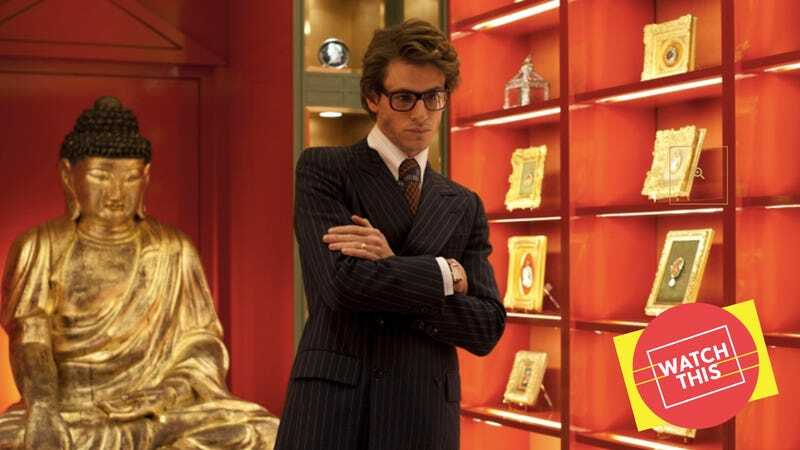 In an odd coincidence, two Yves Saint Laurent biopics hit French theaters in 2014. The first, simply titled Yves Saint Laurent and starring Pierre Niney (Frantz), was by most accounts a forgettable affair; even the French, it seems, are capable of churning out run-of-the-mill awards vehicles. (Appropriately, perhaps, Niney took home the César Award For Best Actor the following year.) But it’s the second, Bertrand Bonello’s Saint Laurent—France’s official submission to the Academy’s foreign language category that year—that’s actually worth recommending. Those looking for an artist-biopic of a queer icon to pair with Bohemian Rhapsody need look no further. Covering a period roughly contemporaneous to that of Bryan Singer’s Freddie Mercury portrait, Saint Laurent largely confines its action to the 1960s and 1970s, when the French couturier (played with tantalizing opacity by Gaspard Ulliel) was at his professional peak. Although the film does highlight artistic milestones like the designer’s 1971 spring and 1976 “Russia” collections, it resists the usual event-checklist approach of most biopics; it’s often more reliant on sensuous atmosphere and intoxicating mood than on a conventional narrative through-line. Working from a script co-written with Thomas Bidegain (Rust And Bone, Dheepan), Bonello forgoes a linear, blow-by-blow progression and instead conceives of the designer’s life as a stylish, hedonistic whirl, complete with a drug-fueled descent that would right be at home in a rock-biopic. There’s no shortage of accomplished actors in significant roles: Jérémie Renier plays Pierre Bergé, Saint Laurent’s steadfast professional and romantic partner; Léa Seydoux appears as Loulou de La Falaise, a notable model and fellow designer; even Helmut Berger (Luchino Visconti’s longtime muse) shows up to play an older version of the artist. Saint Laurent, though, isn’t a film of personalities, but dazzling fragments. A particularly elegant sequence blitzes through entire years, using split-screens—a visual homage to Piet Mondrian, whose art inspired many of Saint Laurent’s designs—to present fashion show footage alongside the tumult of May 1968 and the Vietnam War. No Queen songs feature on the film’s soundtrack, but few working directors have a more intuitive, idiosyncratic sense of how to deploy music than Bonello, who also composes his films’ scores. (The indie distributor Grasshopper Films recently put out an LP compiling tracks from his last three features.) His House Of Pleasures, a lush portrait of a fin de siècle Parisian brothel, made boldly anachronistic use of The Moody Blues’ “Nights In White Satin,” while his latest, the masterpiece Nocturama, memorably deployed everything from Willow Smith’s “Whip My Hair” to John Barry’s theme for the 1970s TV show The Persuaders. Saint Laurent’s own stand-out music moment occurs about an hour in, observing the first meeting between Ulliel’s fashion mogul and the model Jacques de Bascher (a perfectly cast Louis Garrel). From across the dance floor of a coruscating nightclub, the two lock eyes—and it’s woozy, wordless love at first sight. Set appropriately to Patti Austin’s “Didn’t Say A Word,” the scene is perfectly realized down to the last detail: Seydoux’s ecstatic gyrations; the camera tracking a bottle of champagne across the room; Garrel’s nonchalant shoulder brush-off after two men drunkenly brawl over him. Of course, superficial pleasures can’t sustain desire, much less love. But what Saint Laurent understands—as a portrait of a fashion designer ought to—is that an appealing surface can make for a pretty potent starting point. Availability: Saint Laurent is available to rent or purchase from the major digital services. It can also be obtained on DVD from Netflix or on DVD or Blu-ray from Amazon or possibly your local video store/library.